‘Tis the season, and the origin of the term “pecking order” is in full Demo mode. I now have six drakes in the bully pen and only three drakes remain in the common yard with the geese. Emilio is the worst and picks on Vinny and Sal (V&S). Tony can protect them against Boxcar and Boondock (B&B), but not Emilio. Tony picks on poor old Fabio. When I put Tony away, B&B relentlessly chase V&S up onto a brushpile supported by a stump. The brushpile also conceals illicit activity of a more devious variety: Carmen Miranda is sitting on a nest. I yank a couple eggs every time I see her off the nest. The last thing I need is more Muscovies. Shamrock is in the bully pen because he is a jerk. He joins in every fracas and encourages any kind of aggression, like a puny feathered cheerleader. 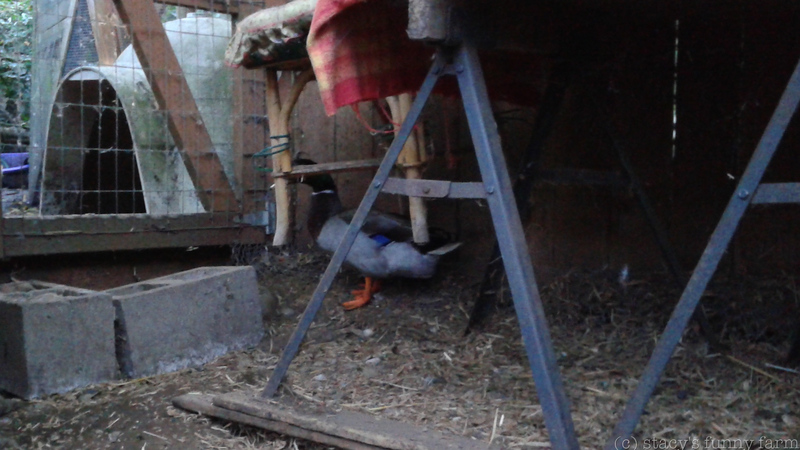 Plus he follows Cubicle, my female goose, around everywhere, which annoys the heck out of Norman. 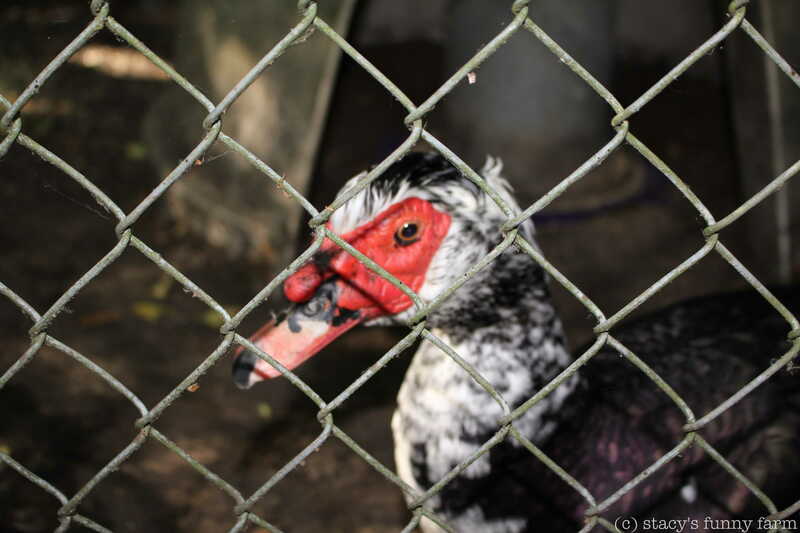 Romeo, the gigantic Muscovy drake is in time out because he is after my hens. I think earlier this spring he actually murdered my older hen, Penguin, but no one’s talking. They behave themselves in the garden. I’ve been letting Romeo out for a couple hours in the afternoon, mostly to give the rest of the bullies a break. Cubicle, Romeo, and Madonna. You can see that Romeo has got his eye on the hen. It’s much quieter in the aviary with everyone locked up. Norman still takes his job as flock manager very seriously. There’s not much to manage, though. Norman on patrol, Cubicle swimming. Grover at the fence, Kitty Hawk hanging back, Winky blending in behind. 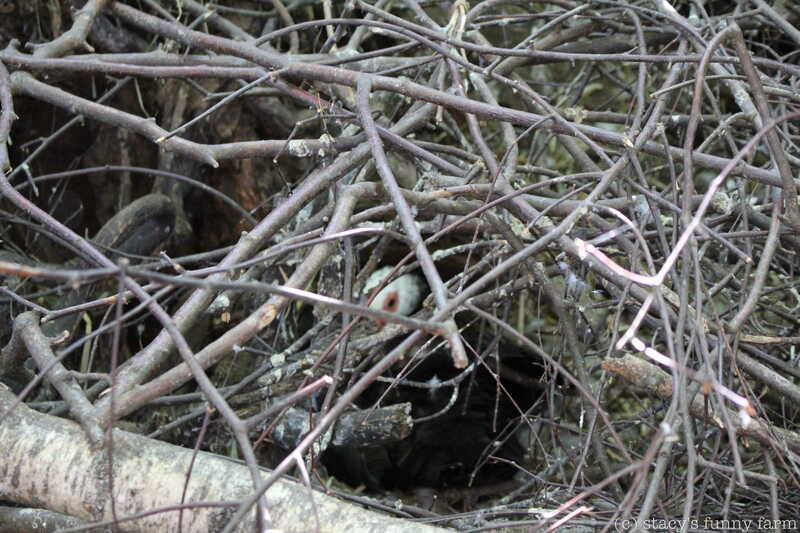 Vinny and Sal are still shy about venturing beyond their brushpile, and they won’t go out to the yard with the hens. Once their confidence is restored in the aviary common yard, I’ll let the bullies back out, one at a time. Maybe. Sal and Vinny, checking out the pond. Jello the hen in the distant yard. And that’s Norman’s neck and head, mid-photo. Dang it. Time to lock up Romeo. He’s huge, but surprisingly easy to grab. Muscovies have really sharp toenails, so it’s all about technique. Sal averts his eyes as Romeo attacks Madonna the hen. This is when I threw down the camera and made things right. Darn you, Romeo! It‘s really no surprise that the meekest of the ducks are shy about reclaiming their territory. Old Fabio, named for his head pouf, has been here since late 2006. He’s at least nine years old, and walks like your grandpa. His head pouf disappeared about when he lost his curly drake feather. He’s always been scared to death of me, and now that the six ducks he came in with are gone, he’s kind of lonely. B&B are very protective of him, but they attack V&S so they are locked up. For now, Norman looks after him. Fabio, Vinny, and Sal hanging out near their friends in the bully pen, just out of the photo, stage left. The other drama queen is Lula, my poor little hen. We aren’t certain what her problem is, but it has been going on now since spring 2014. She’s on Metacam daily, and while she walks like your grandma, she is walking again. She has a hard time getting up to her roost at night, so I have been helping her up if she asks politely. Tonight she did. Other times I discover her up there already. One problem is that we can’t eat her eggs because of the Metacam (meloxicam). She is a very sweet hen, and comes over to get her medicine when I call her. So I went back inside for the evening and I think I’m through dealing with bullies. But, NO! Here is tiny Spike the Budgie, terrorizing The Pirate, my handicapped dove. She put up with his pacing and haranguing, and then she suddenly lunged at him! He took off, flew to the kitchen via the dining room, landed right in his own cage! Nice flying, Spike! Today I rounded up all the bad boys and set up the bully pen. At a certain point, Norman the goose takes his job much too seriously and works the graveyard shift, too. When I can hear his supervising honks all night long, it is time for action. 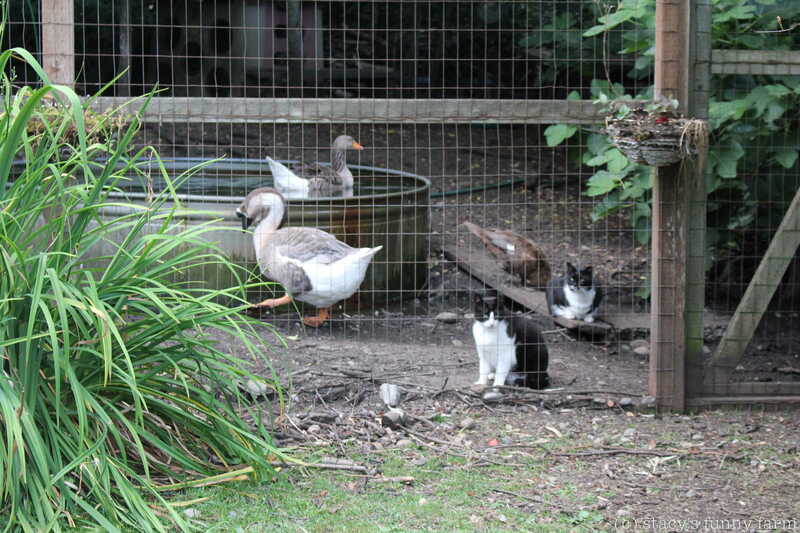 Outside the pond, L to R Vinny, Sal, Romeo, and Cubicle. 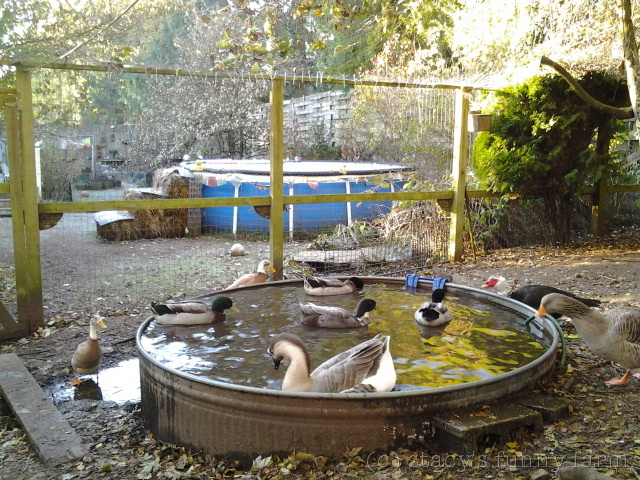 In the pond clockwise starting with Norman the Goose, Boxcar, Boondock, Emilio, and Tony at the center. Here are a couple photos of better times, AKA fall and winter. Most of the fighting is a springtime affair, but it takes a while for everyone to kiss and make up. Norman is the big gander with the black bill. Cubicle is the smaller goose with the orange bill. Shamrock, a tall gray runner duck, is in love with Cubicle, but she doesn’t take him seriously, so Norman is okay with it. Around the corn, happily eating together are Vinny, Fabio, Tony, Emilio, Shamrock, and Boxcar. 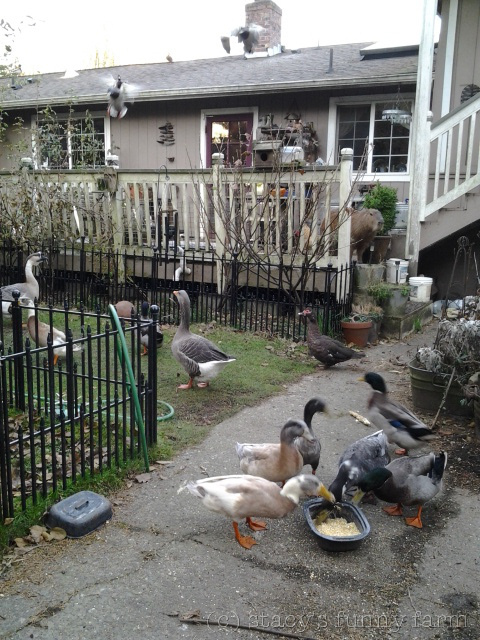 That’s brown muscovy duck Winky behind them near the lawn. On the grass are Norman and Cubicle, Boondock, and Sal. This photo is from last November, and nobody is fighting. Oh, photobomb by the capybara and a couple mallards in flight from the roof. My oldest drake, Fabio, is about 9 years old. The head pouf he was named for has long gone, along with his curly drake feather. He limps around pretty well, but he’s lowest on the totem pole. 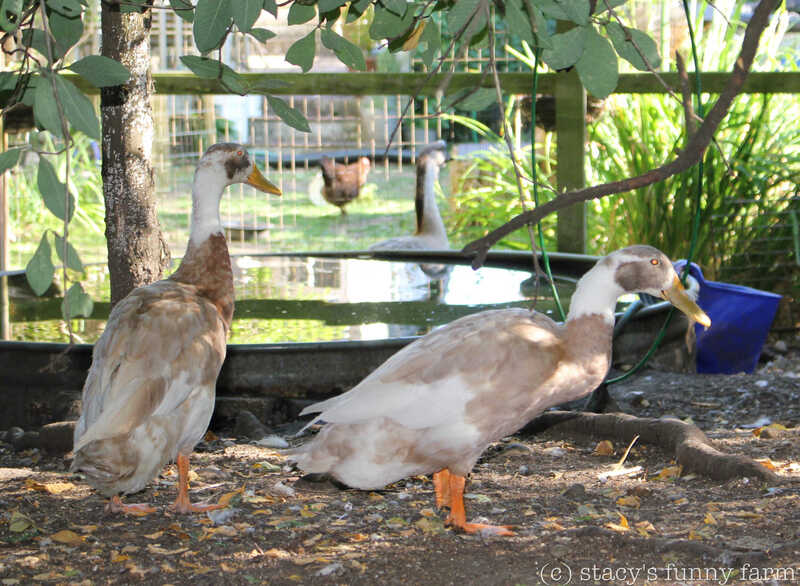 Two of the Rouens (fat mallard-colored drakes), Boxcar and Boondock are very protective of him. 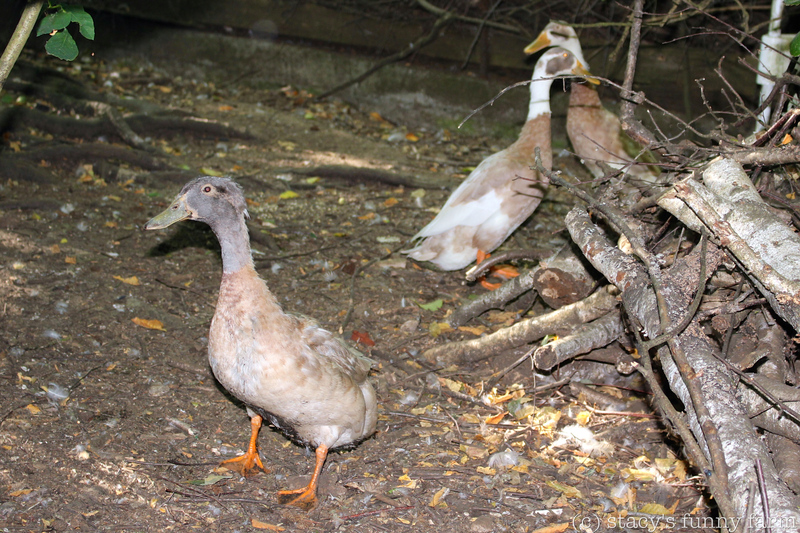 Tony, a mostly-black duck who came here from Pasado’s Safe Haven with Vinny and Sal, despises Fabio. Tony attacks Fabio when Boxcar and Boondock let down their guard. However, Tony is the primary protector of Sal. For some reason, my third Rouen, Emilio, despises Sal. So, Sal has become a tree duck, fiercely defended by Vinny and Tony. I have arranged a feeding station up there for them. Lately, though, Norman gets up there and helps himself to lunch when he’s in the neighborhood. Nobody messes with Norman. 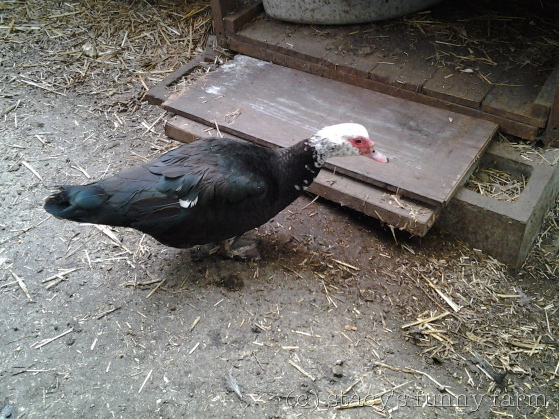 Except Romeo, my muscovy drake. He nearly put out Norman’s eye one spring, but for some reason, Romeo hasn’t tried to kill him this year. I suspect the muscovy ducks, Winky (disliked by ALL the poultry) and Carmen (loved by all), are keeping him busy. Emilio has been a prince about getting penned with the cats every evening. Or maybe I am an exceptionally experienced Duck-herd. With Sal in his tree, and Emilio locked in the cat pen at night, it has been quieter. We have passed the summer solstice, and they will slowly quit fighting on their own, but to accelerate the process, I have separated the four worse offenders into the bully pen. This should break the bond between the aggressors and the under dogs more quickly than if I allow the aggression to continue. I’m also concerned about poor Sal and Fabio, for whom life has not been lovely this summer. I’ll continue to watch for bullying- often one of the others will rise to alpha with the bullies gone- but it should settle everyone down pretty quickly. Last year, I had to separate them much earlier and for much longer, so believe it or not, this is quite an improvement! Sir Poopsalot, gatekeeper to the Bully Pen. 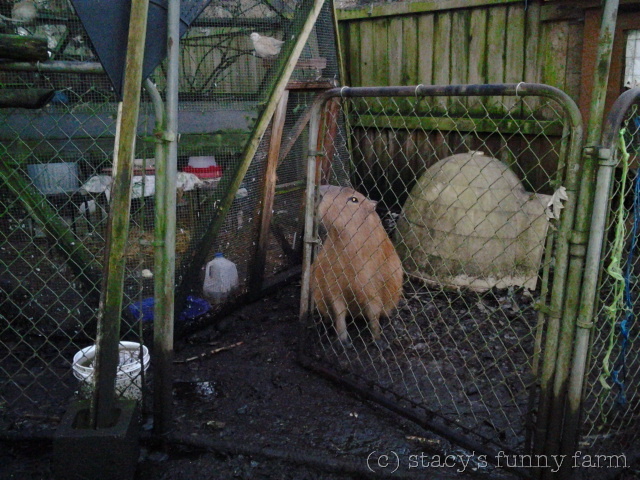 Welcome to the bully pen, Emilio, Tony, Romeo, and even Shamrock, who doesn’t pick on anyone in particular. He’s just a jerk. Stay tuned, and I’ll let you know how it goes. Daily Drama — Dobby Style! Let’s take a walk out to the aviary. 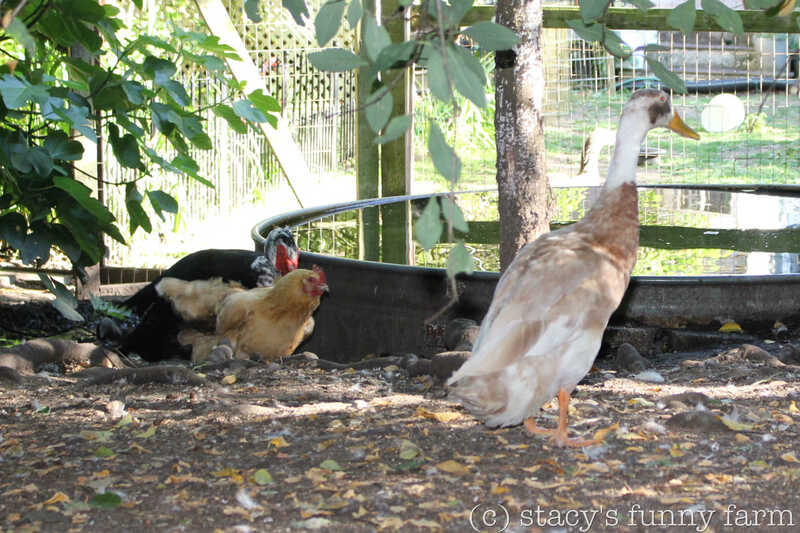 Lula the hen, and Winky the Muscovy duck share a nest. Look at these silly girls! They are sitting on . 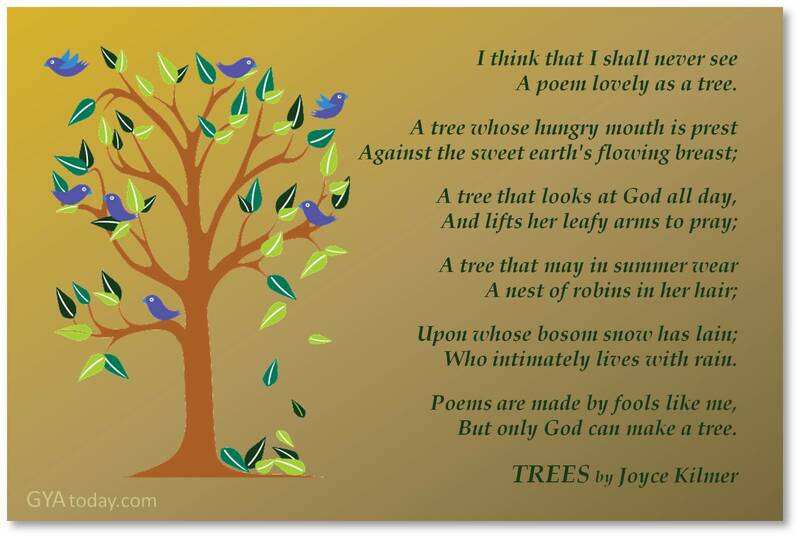 . . a nest. No eggs, just a nest. Lula gets hauled out of there to get her medicine every day and Winky complains about nothing. Personally, I think they are just lazy. Carmen examines the plank blocking her cave. 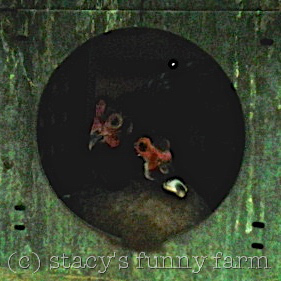 Our other Muscovy duck, Carmen Miranda, has laid eggs in several places so far, but her newest place is UNDERNEATH this old storage unit, in a hole. She can get way under there, which makes it hard to know if she’s even there. Does she think she’s a badger? I bet she’ll have that wood dragged away from her entrance by this afternoon. Every year our drakes bully each other. We usually have to separate them, but this year, Sal is trying out a new strategy. This is a brush pile over an old stump, and he perches up there. Vinny and Tony hang out up there, too and the other ducks don’t bother them. Old Fabio (he’s 9) gets bullied but he has two buddies who stand up for him. They have claimed the bully pen area and everybody leaves them alone. Romeo the Muscovy Drake doesn’t seem to be as dedicated to murdering Norman the goose this season, and everything is fairly orderly out there this year. Penguin is the black one. This is our very sad story. Our oldest hen, Penguin, was found dead at the first of the month. This photo was taken the day before, and she looks fabulous, doesn’t she? She had a slow winter but had been laying eggs, so we suspect Fowl Play, but it really doesn’t matter, now. She was a good hen. Now we are left with Lula the sick one, Jello the naughty one, and Madonna the intellectually challenged one. The ducklings have dispersed but we still see this little group. The six are now five, but they are fat and happy. And that’s what he wrote about the Funny Farm. Personally, I think he should have been more respectful of his friend, Penguin the hen. She was nearly as old as Dobby, and I know he was especially fond of her. The big news wasn’t really about the Funny Farm at all. Dobby has every right to be proud, though, because he made the cover of Guinea Pig Magazine! An exceptionally fine publication, he was featured in a magnificent six page section of the magazine! You can order your very own copy of the magazine – or subscribe! – here! That’s little Dobby at the bottom left corner.